The Street Fighter series will always remind me of different moments of time in my life. I can remember playing (and losing) a lot of games of Street Fighter II: Championship Edition on the Mega Drive as a very young child, improving slightly by the time Street Fighter Alpha 2 arrived on the Saturn and eventually becoming decent after the release of Street Fighter III: 3rd Strike on the PlayStation 2. Despite the age of these games, they’ve managed to age so well while maintaining very unique feels to each of the three series (SFII, SFA and SFIII). Capcom released a game that celebrated the 15th anniversary of Street Fighter, but it wasn’t done anything like this. To celebrate the 30th anniversary of the Street Fighter series, Capcom has released the Street Fighter Collection – bringing together all twelve of the main games in one package. Spanning from 1987 all the way to 1999, fans can play through the garbage beginnings of Street Fighter 1 to the pinnacle of fighting games that is Street Fighter III: 3rd Strike. Out of the twelve available games, only four of them are playable online: SFII: Hyper Fighting, SFII: ST, Street Fighter Alpha 3 and SFIII:3S. Unlike most of the Street Fighter games that have been released on consoles, the games in this collection are the arcade versions. Fighting game purists will love this as every game is “arcade perfect”, meaning they run exactly as they do on the original hardware. As you would expect with the arcade versions of these games, the only mode you can expect to find is arcade mode. Modes that a lot of players take for granted like training aren’t available in every game, only the ones that feature online play. The training mode is barebones with damage/input overlays that don’t match the art of the game, but at least it gets the job done. Compared to any modern Street Fighter game which almost certainly features relaxed inputs, the Street Fighter Collection forces you to do everything properly. You won’t get any accidental dragon punch commands in a game like 3S, which is both good and bad. It’s good because when you land a great combo you know that it was 100% you, however, the bad part is that when you are playing using a Switch D-Pad that you probably aren’t going to land any dragon punches. This is where having an arcade perfect port of all of these games isn’t great for everyone, specifically casual fighting game fans. Relaxed inputs have become the norm nowadays making it difficult for those who are used to games like Street Fighter IV and V to adjust. It’s very difficult to play any of the Street Fighter games in this collection on the Switch in handheld mode unless you happen to have one of those Joy-Cons with a proper D-Pad. 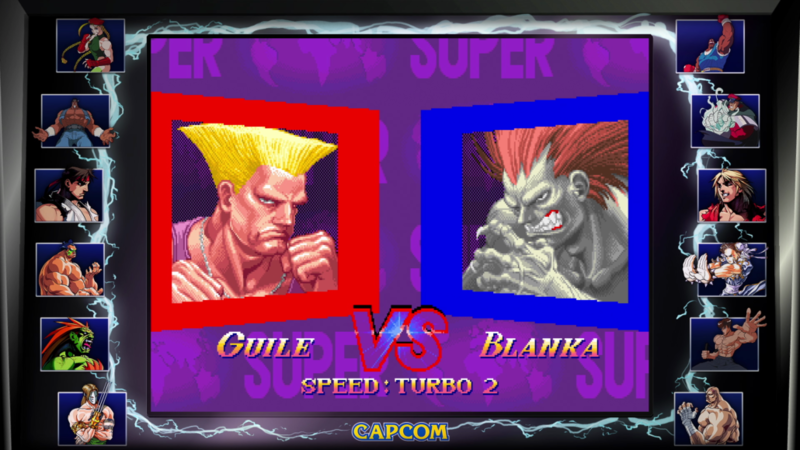 Arcade games like Street Fighter work best when played locally as it guarantees there won’t be any lag during a fight. These days developers can’t get away with releasing a game without any online capabilities, however, that doesn’t mean these online features have to be any good. Unlike almost every single fighting game with an online mode, none of the games in this collection features a prompt before fighting to tell you what the connection might be like. Whether you play ranked or casual, you will never know what region your opponent is from until you get a chance to ‘feel’ it in-game. In every game, you can ‘feel’ just how bad it is when your game starts to lag right from the character select screen. I must’ve played thirty games with only five of them running at a playable speed. Not only does the game run poorly when you play a laggy game, the sound also becomes incredibly choppy. It doesn’t help that most people playing the Switch version will most likely be using a wireless connection, though there have been reports of the netcode being poor on the PlayStation 4 and Xbox too. It’s frustrating because there are instances where the online matches are very good, but there’s no region filter to ensure you get consistently smooth games. Okay, so the online multiplayer isn’t good, surely the local multiplayer must be fine? Well, it mostly is. Fighting against your friends across several Street Fighter games has never been faster, and since these are old arcade games load times are virtually non-existent. I do have a small issue with the stages not continuing to change once you select ‘random stage’ before fighting, but I understand this is a limitation of the arcade games. My biggest problem with this game is that the rematch option at the end of each fight defaults on ‘no’. How did no one developing this game think this was a bad decision? Everyone who plays fighting games mashes start or the A button after a game ends in order to get into another match. It shouldn’t default on the option that kicks you back into the game selection menu. There’s also no scoreboard at the end of games to let you know who has the most wins, a feature that even appeared on the SFII ports for the Mega Drive and Super Nintendo. With all this being said, I’ve already spent more than twenty hours going through each of these games with my brothers, playing them just like we did when we were kids (except nowadays we use arcade sticks). If you play any of the games in the collection, make sure you go through arcade mode rather than the built-in versus mode as it speeds up the process significantly. It would’ve been nice if the collection had a better way of improving the local multiplayer experience, but the arcade modes are set to free play, so they do just fine. It’s the little things with this collection that add up to highlight a big issue overall. While it’s great to get arcade perfect versions of these games on every platform, it’s the enhancements made in previous titles that players crave. 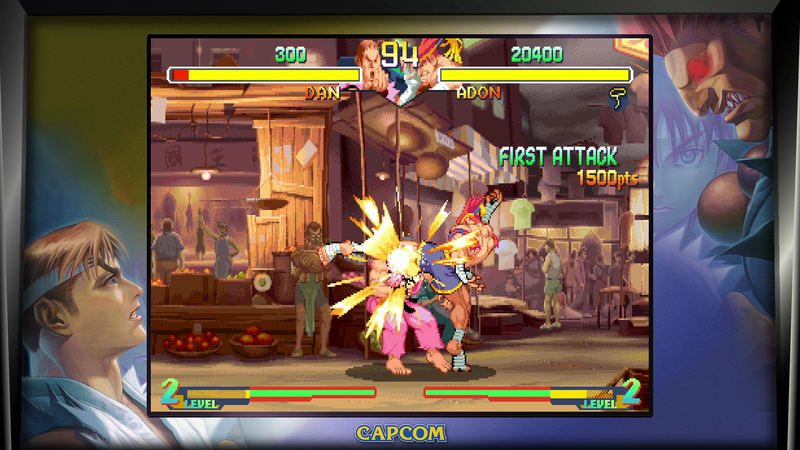 There were a number of major improvements to the arcade version of 3S in Street Fighter III: 3rd Strike Online Edition (3SO), things like character trials to learn combos, a dedicated practice space purely for understanding the parry system and more. You’ve also got the Nintendo Switch exclusive Ultra Street Fighter II: The Final Challengers which added brand new modes while tweaking the gameplay mechanics to improve the original game. Having the base versions of all twelve of these Street Fighter games is great, but it would’ve been even better if a little effort went into making each of them slightly better than the original versions. In terms of performance, the Switch version looks and runs exactly as the other console versions do. When it comes to which version of the game you should pick up, the decision should be made based off of two things: do you have an arcade stick (or controller you enjoy using) and does playing on the go matter to you. If you honestly believe this game is playable in handheld mode, then you will need to think again. As I stated earlier, unless you own one of the JoyCons with a D-Pad, you will have a hard time executing a lot of commands. I struggled using the Pro Controller in these games, giving my thumb a blister after playing for a few hours. Do yourself a favor and purchase either a good controller or converter for the Switch, otherwise, you are going to struggle. Reviewed on Nintendo Switch (copy purchased). You can purchase the game via Amazon. The inclusion of an informative museum mode and a music player that lets you play every track in each of the games isn’t what fans want out of a Street Fighter collection. That stuff might be interesting to look at for a few minutes when you first buy the game, but the things people are actually after are more effort being put into the games themselves. An option for input leniency would’ve been incredible, especially for those that are playing on the controller their console came with and not an arcade stick. Additional modes like Alpha 3’s World Tour on the Dreamcast or 3SO’s character trials would’ve been much so much more appreciated than what we received. This collection does exactly what it promises to do which is provide arcade ports of twelve classic games, but it does nothing more than that. The games in this collection are timeless; they deserved far more respect than this.